I don't think I tainted my system (through other forms of testing) to have that show-up, so am filing this ticket to see if it can be validated against a pure PureOS install, and if so, then it can be discussed if that is proper policy or a freedom issue. Reassigning to Matthias, our expert on AppStream (including what and how much PureOS has derived from Debian in that area). I am not sure I understand the problem - what is the issue here? That extensions can be downloaded from GNOME? Since we trust GNOME already, I don't think it makes sense to disallow that in GNOME software, especially because doing so means people will have trouble installing GNOME extensions. Installed the latest ISO in Boxes. "UTC" did not come up in search. So, to confirm, our Software center does indeed send requests outside of pureos.net? And outside of our hosting? If so then we can move forward on what the policy should be. I will dig a little on the policy, but would like to hear from Jonas on that policy topic, and Kyle Rankin on the (obvious) issue of third-party packaging being utilized. 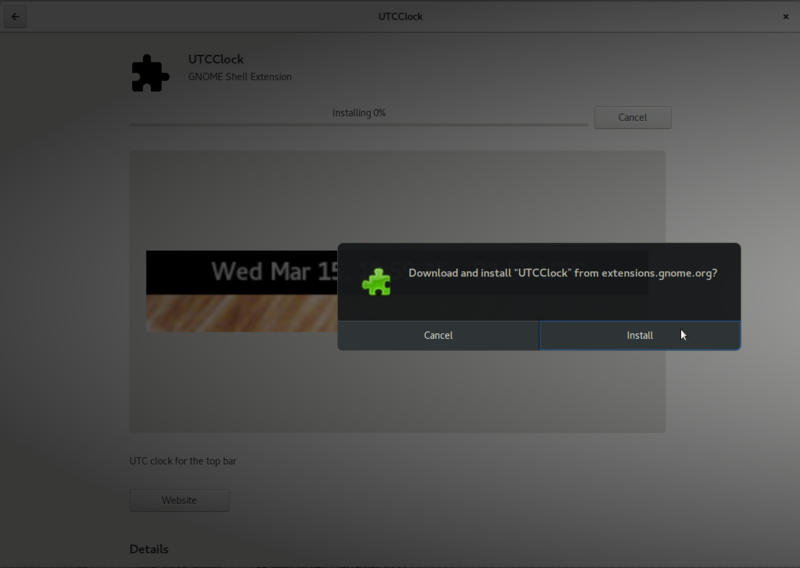 the ticket I pasted above shows the "warning" that highlighted this issue to me... "Download and install 'UTCClock' from extensions.gnome.org? dos: GNOME Software is always very clear about where stuff is coming from, in this case it even shows the origin in the system authorization dialog. It didn't show up in search for me. Latest ISO. @todd It seems to me that your question at 11:52 was ambiguous: I guess you intended to ask about _default_ behaviour, and to me it is more likely that Matthias answered only about _ability_ - i.e. that Software center sends requests outside of pureos.net if told to do so. Therefore I disagree that @james.rufer's test is counter to @mak's answer. I believe we need to understand not only _if_ but also _how_ Software center can reach a state where it sends requests outside of pureos.net. Case a) is forbidden by FSF (but arguably tolerated by Debian). Should IMO be forbidden by us. Case b) is forbidden by FSF (but tolerated by Debian). Should IMO be forbidden by us. Case c) is tolerated by FSF (and acceptable by Debian). Should IMO be discouraged by us (e.g. not actively enabled if disabled in Debian). Case d) is acceptable by both FSF and Debian. Should IMO be acceptable by us. @james.rufer GNOME Software will fetch an extension list when run under GNOME Shell. So, you'll need to run it in a GNOME Shell session and the GNOME site has to be reachable. Try refreshing the software index (refresh button in GNOME Software) in case information is missing. This seems like what I would have assumed. The only middle-ground would be using an approved *just-as-strict* repo, so pureos.net + extensions.gnome.org (IF extensions.gnome.org == FSF endorsed). @james.rufer it looks like @mak has one more thing for to test to confirm what state we are in (from Jonas's list). I suspect neither e) nor f) is tolerated by FSF. That's why I didn't list those previously. Sorry, above was inaccurate: I _do_ expect FSF to tolerate _FSF_ hosts as "middle-ground" but not e.g. "extensions.gnome.org". Even if FSF should tolerate "middle-ground" - be it their own hosts or hosts of e.g. GNOME, I recommend that Purism forbid that anyway. Reason is that we cannot offer our users a trustworthy system if we are not the only gatekeepers of what gets installed.